Please note that the content of this book primarily consists of articles available from Wikipedia or other free sources online. 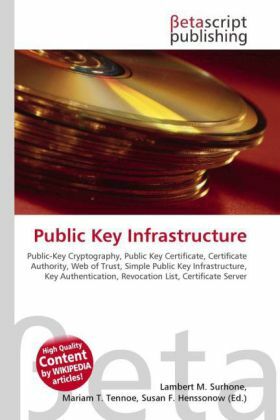 The Public Key Infrastructure is a set of hardware, software, people, policies, and procedures needed to create, manage, distribute, use, store, and revoke digital certificates. In cryptography, a PKI is an arrangement that binds public keys with respective user identities by means of a certificate authority. The user identity must be unique for each CA. The binding is established through the registration and issuance process, which, depending on the level of assurance the binding has, may be carried out by software at a CA, or under human supervision. The PKI role that assures this binding is called the Registration Authority. For each user, the user identity, the public key, their binding, validity conditions and other attributes are made unforgeable in public key certificates issued by the CA.